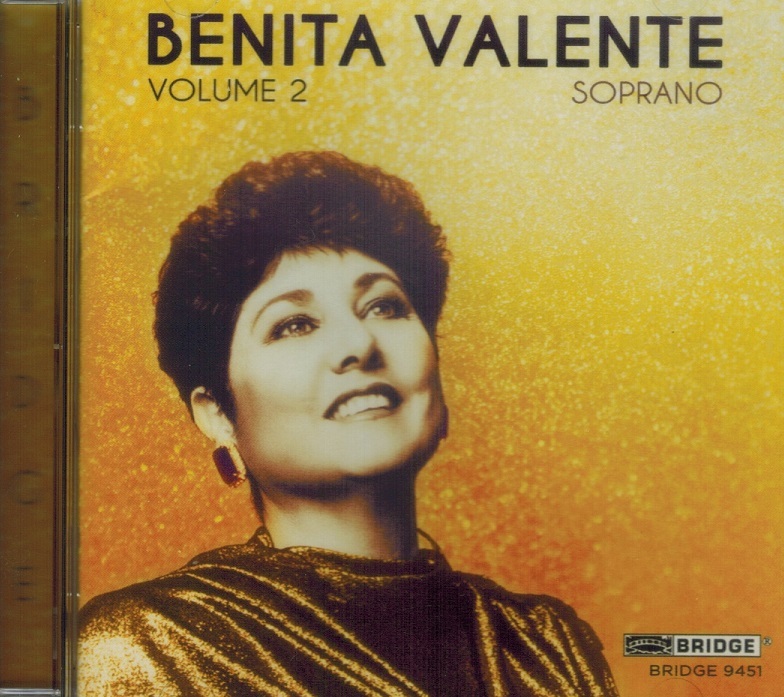 “This second volume of recordings devoted to the great American soprano, Benita Valente, contains studio and concert recordings made between 1980 and 1985. Volume 1 of of this series was issued as BRIDGE 9316 [V1627]. FANFARE called it ‘An eloquent recital. A lovely bright voice, excellent technique as well as astounding versatility. Simply a wonderful recording celebrating the career of Benita Valente. The program opens with a piece by Schubert for clarinet and soprano and the gently understated 'Romanze'. The 'Gretchen Am Spinnrade' and three Mignon songs set an unofficial theme: ‘young and vulnerable woman'. The performances are classic; thoughtful, clean, everything you expect from a world class singer. Three gentle pieces by Robert Schumann are followed by a large selection of Richard Strauss songs, mainly his most popular ones, including the Ophelia songs. Her 'Einerlei' is exactly the way I like it - lilting, light, and sweet. The program ends with a group of Hugo Wolf songs, including a few of my favorites: 'Er ist's', 'Verschwingene Liebe', and 'Das Verlassene Mägdlein'. 'Mausfallenspröchlein' is a charming way to end a lovely program. The pianists are all terrific, as is Harold Wright. If you're a Valente fan (as I am), don't miss this. Brief notes, texts, and translations." “Benita Valente has had a curious career. It has not been an unsuccessful one - her voluminous program biography easily refutes that notion. The curiosity lies in the discrepancy between her prodigious gifts and her relative lack of renown. She is as gifted a singer as we have today, worldwide. Yet for whatever reason, she is not an inescapable feature of our recordings or our operatic life. Miss Valente is a soprano of a particular type. 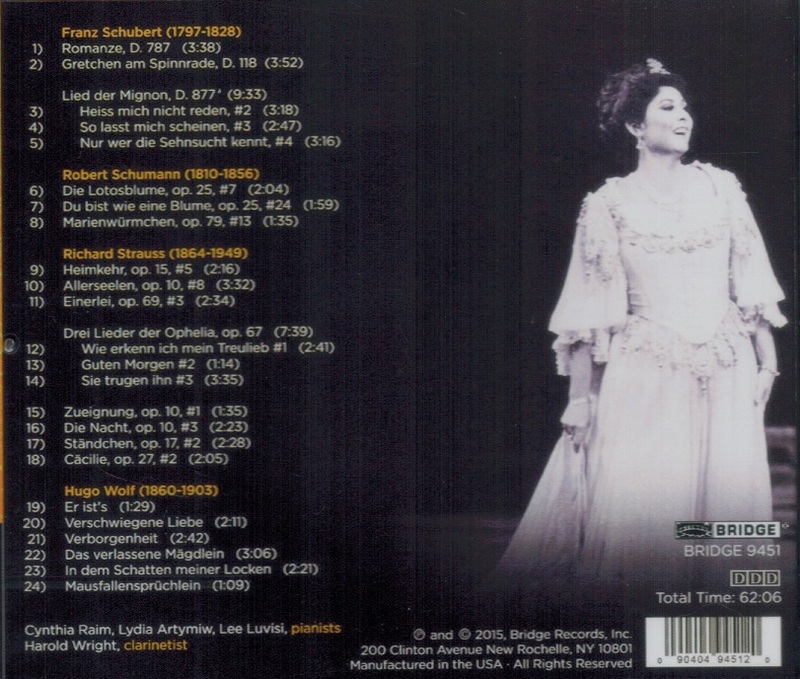 It is not surprising to read that she has sung Pamina in Mozart's ZAUBERFLÖTE more than 200 times, because her voice seems so perfectly suited to that role's timbral, technical and temperamental demands. That voice is a light lyric soprano with a cool nasality of timbre. All the hallmarks of bel canto technique are hers to command - the ability to sing evenly at any part of her range, loud or soft; the skill to ascend smoothly through the various registers; a complete lack of obtrusive wobble or hoarseness." “Quietly and with infinite grace, Benita Valente fashioned a major musical career. Her exquisite lyric soprano voice and uncompromising musicianship have left a distinctive mark on a breathtaking rage of repertory�.As she passes on her artistry to a new generation of singers, Valente can look back with quiet pride on a distinguished career that covered the musical spectrum."